Yay! Another clear night. After yesterday’s session was cut short by cloud I was keen to continue working my way through the Herschel 400 – only another 200 or so to go! Once again I used the 14” skywatcher tracking dob. NGC 6781 PN Aql Quite an attractive nebula if somewhat bland circle. Appears to be slightly brighter on one side (very subtle if at all) with a slightly darker centre. Responds well to averted vision and enhanced somewhat by UHC filter. 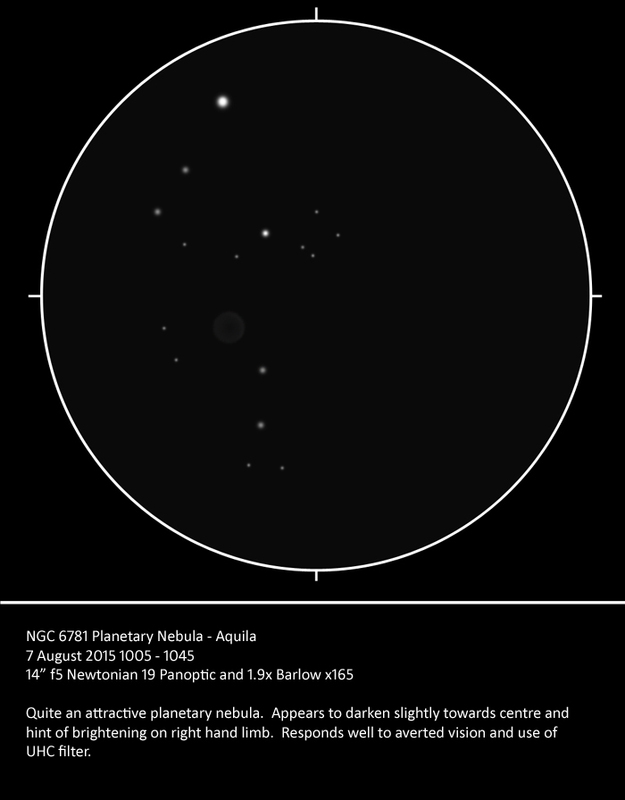 The sketch was interrupted by my wife bringing a very welcome tea and joining for a quick look at M11 and M57. NGC6755 OC Aql Small group of faint stars that appear to be in two clumps. NGC 6756 OC Aql Tiny cluster only a few arc minutes across but quite rich and dense. Needs a high magnification. Comet Lovejoy – Draco. 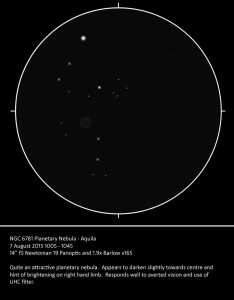 Using the finder chart on skyhound’s comet website I tracked down this faint visitor. Comets normally rush in and out in weeks but Lovejoy seems to have been around for ages now. Anyway, it was very faint, and comparing it to nearby galaxies NGC 5905, 5907 and 5908 (the joys of goto) I estimated it to be magnitude 11.5 and only a few arc minutes across. I did make a sketch but it was a faint smudge with only 4 faint stars so it hasn’t been worth transferring across from my notebook. It was not 1140Z (1240L) and a few patches of altocumulus were drifting across from the south making observations challenging. As Delphinus was well placed – and clear of cloud – I went Dolphin hunting. While watching the clouds, a bright meteor mag 0 (compared to Vega and Altair) shot across the southern milky way, just missing the Altair-group of 3 stars. NGC 6905 PN Del Nicknamed the Blue Flash. Limited viewing due to cloud and no chance to see effect of UHC filter. Small but bright nebula only visible intermittently through cloud. As the cloud seemed to be staying around and my daughter’s wakeful night had finally caught up with me I packed up at 0100L. While speaking to neighbour Bob Ford the following day I found out the cloud had cleared leaving a clear sky and last quarter moon in the early hours of the morning. Oh well!